This is homage to the tailoring house of Tommy Nutter who became renowned in Savile Row from the 1960s. He would cut sister cloths together, so if you look at the image closely, it has got piping on the edge of wide 70s-style lapels. 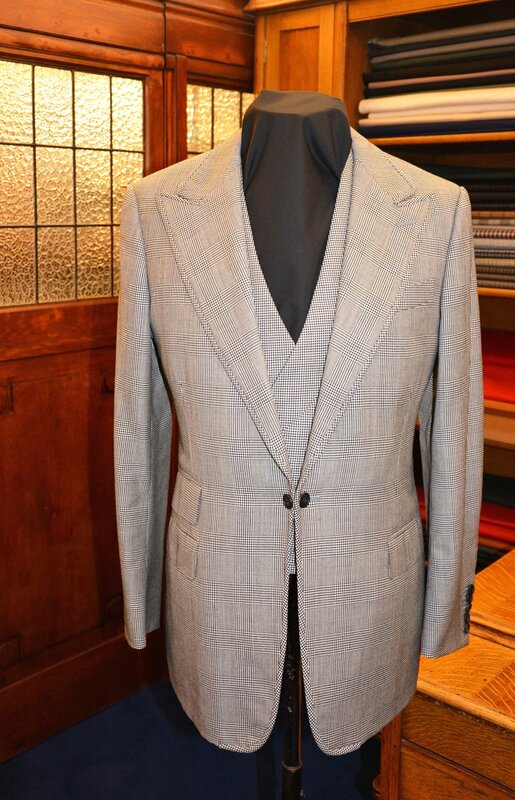 The edge of the lapels is piped in a hounds tooth cloth and the actual jacket is made out of a grey check. But they are very, very similar cloths. The waistcoat is in the hounds tooth fabric as well, cut in a double breast. The jacket really is trying to capture that Tommy Nutter look, although the trousers are not flared so they kind of give a more modern edge. Note lastly the link button, which you can either do up normally or just have it on that link. A statement piece!